LED video lights can be tremendously useful for videographers and indie filmmakers for two main reasons: they’re small and often light so they can fit into tight spaces and small lighting kit bags, and they’re also often dimmable, which saves you from fussing with sheets of diffusion or external dimmers that can change the color temperature of the lights. LED lights for video tend to provide flattering, even lighting on your subject and they also don’t heat up like traditional video lights. While LED video lighting kits don’t draw much power for the amount of illumination they provide, they can be a bit pricier than traditional lighting fixtures and video lighting kits. We’ve compiled a list of some of the best cheap LED lights for video and film. If you’re looking for a cheap, focusable spotlight type LED video light, this model will suit the bill. It’s a rectangular LED spotlight that has a built in dimmer dial (also available in a round spotlight that puts out a bit less lighting power). This LED spotlight comes with barn doors for lighting control and additional focusing and is daylight balanced (though of course with lighting gels you can adjust the color temperature it produces). Equivalent to a 225 watt incandescent bulb. 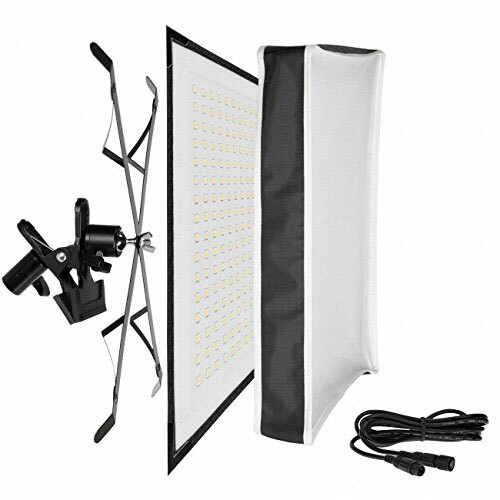 Also available in a two light kit with stands and a carrying case. If you’re looking for a cheap LED lighting kit that has everything you need included, this Neewer LED lighting kit might suit your needs. It includes 3 square LED panels, 3 stands, and a carrying case that everything neatly packs into for traveling. 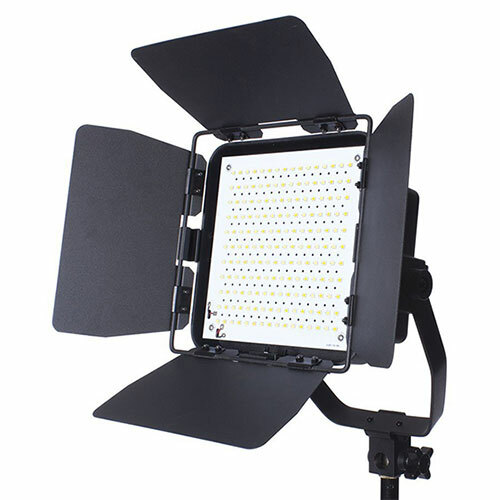 These LED video lights are dimmable and are daylight balanced but the kit also comes with hard gels to balance closer to 3200K (indoor lighting balanced) as well as diffusion panels. Here’s a unique twist on this model: each light comes with three slots on the back to plug in cheap Sony NP batteries (or even cheaper knockoff batteries) so you don’t even have to plug these lights into the wall to turn these into battery powered LED lights which you can take anywhere. Another neat feature of this LED lighting kit is that the square lighting fixtures have handles at the bottom which mount on the included lighting stands but they are also flexible to adjust to several angles (you can see example images of this in action on the product page). In a pinch you could also use them as a handle for the light if you were going to use it handheld in a run and gun style scenario. 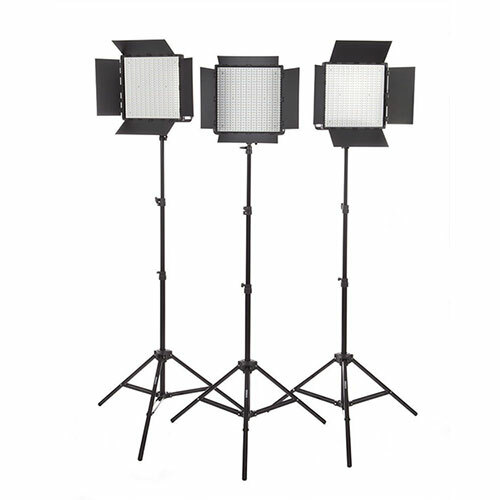 Also available in a two light kit with stands and a carrying case. StudioPRO has been providing cheap LED lights for years now and is one of the major players in this market for affordable video lighting. 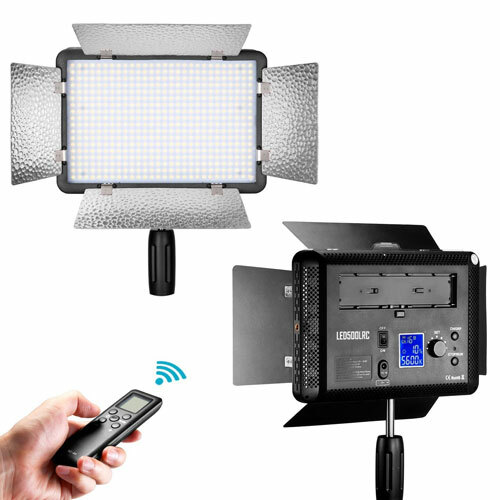 This LED video light kit comes with three 600 watt equivalent LED lights complete with mounting yokes, barndoors and lighting stands– basically all you need to set up a three point lighting scheme. This particular kit also comes with key advantage besides being a complete ready-to-go kit: its lights are bicolor, meaning they can switch from daylight balanced to tungsten balanced at the turn of a dial. This is particularly useful when you’re trying to match the color temperature of indoor lighting fixtures or shooting outside and need to match daylight. Each one of these three lights also comes with a custom cut amber gel and a neutral color diffusion panel as well as a set of barndoors to shape the direction of the light. 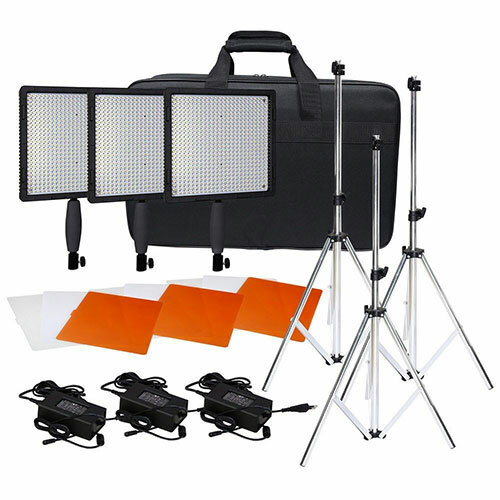 At a reasonable price this kit is perfect for a documentary film interview lighting kit or indie filmmakers. Also available in a two-light kit if three lights is more than what you need. Additionally, if you already have a lighting stand and don’t need barndoors you can also purchase this item as a single light. If you’re setting up lights in a one man band scenario or you’re short on time, a lighting system with a remote control can be extremely useful. This LED lighting kit includes two lights, lighting stands, a carrying case, batteries, chargers, and a wireless remote control. The remote allows you to adjust both the intensity (brightness) of the light, as well as the color temperature to match either indoors (tungsten) or outdoors (daylight). This can be especially useful when you’re looking at your video camera’s LCD and want to know how lighting adjustments will influence the whole look of a scene in real time, as opposed to having to dart around the set to adjust things and then run back to your camera to see how the adjustment turned out, only to have to run back to the lights to make a further adjustment and check it again. We’re pretty impressed by the number of features this cheap LED video lighting kit packs into a relatively small price. What is the wattage equivalent of these lights? Generally speaking, LED video lights actually use a very small amount of power, but the amount of light they provide is sometimes still measured in watts. The higher the wattage equivalent, of your lights, the better. For instance, if a lighting kit you’re considering only offers the equivalent of 100 watts, we’d suggest looking at a different LED video light (unless you’re buying a very small speciality light like a portable camera-mounted light for instance). Is this LED video light system dimmable? One of the great advantages of LED lighting systems is that they’re often dimmable without compromising the color temperature of the light. With traditional incandescent lighting fixtures, the less power you provide it (with an external dimmer dial for example) the more yellow the light will look. LED lights don’t have this disadvantage so many (but not all) manufacturers are building their lights with dimming panels or switches or dials on them. Be sure to check if the lights you’re considering have a dimmer built in. What is the color temperature of these lights? “Daylight” balanced LED video lights will be slightly cool bluish with a color temperature of approximately 5500K while “Tungsten” lighting matching normal indoor color balance is closer to around 3200 degrees kelvin, a warmer yellower balance. Expensive LED lighting fixtures will be bicolor, meaning you can switch from one temperature to the other on the fly but for cheap LED lights you’ll need to use blue or yellow lighting gels to convert from one color temp to the other. Some LED lighting kits will even come with custom cut hard gels that will lock into their fixtures (though it’s important to note that these may not always be the exact right color temperature so gels are more flexible and exact). Is this LED a flash or continuous light? This is an obvious one but if you’re going to be shooting video (as opposed to stills) you’ll want to make sure any LED lights you’re considering are continuous lights– in other words they’re on until you switch them off instead of just being a flash bulb type system which film photographers use. All the lights linked to in this article are the appropriate continuous video lighting type as opposed to flash, but if you’re searching elsewhere just be sure you don’t accidentally purchase photographer’s lights. Is this a battery powered LED light? Is it possible to use it with batteries and no wall plug? Most non-camera mountable LED lights aren’t designed to be operated via battery but a growing number do have mounts on the reverse side to attach either a Sony V-Lock battery or a V-lock adapter for cheaper Sony NP series batteries.